Preparation: This is where I feel a bit let down in my recent visits. 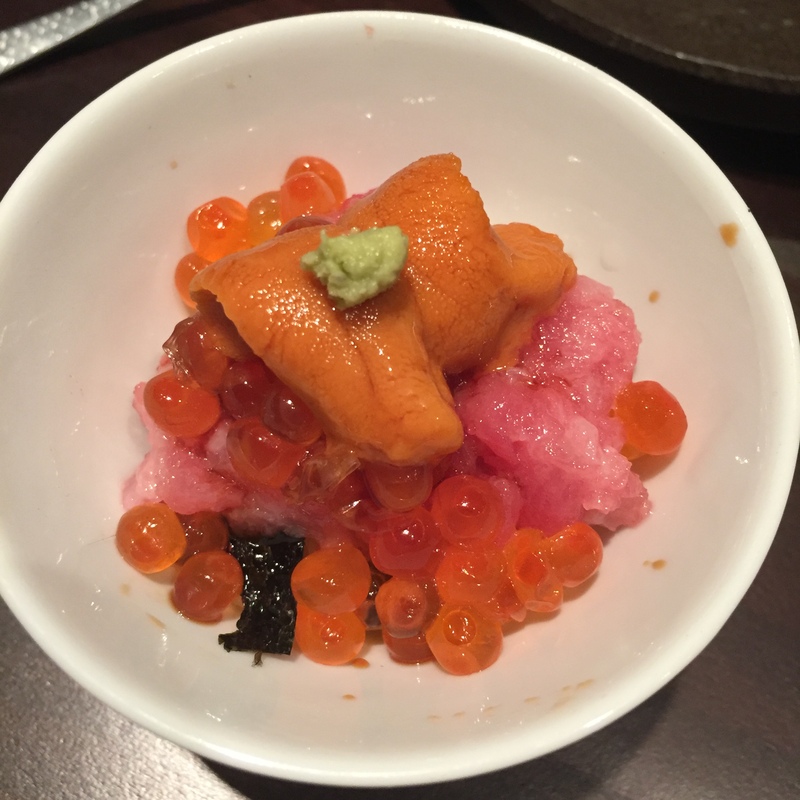 My biggest pet peeve with sushi chefs is drowning the fish in outside ingredients, suppressing the fish’ natural flavors. 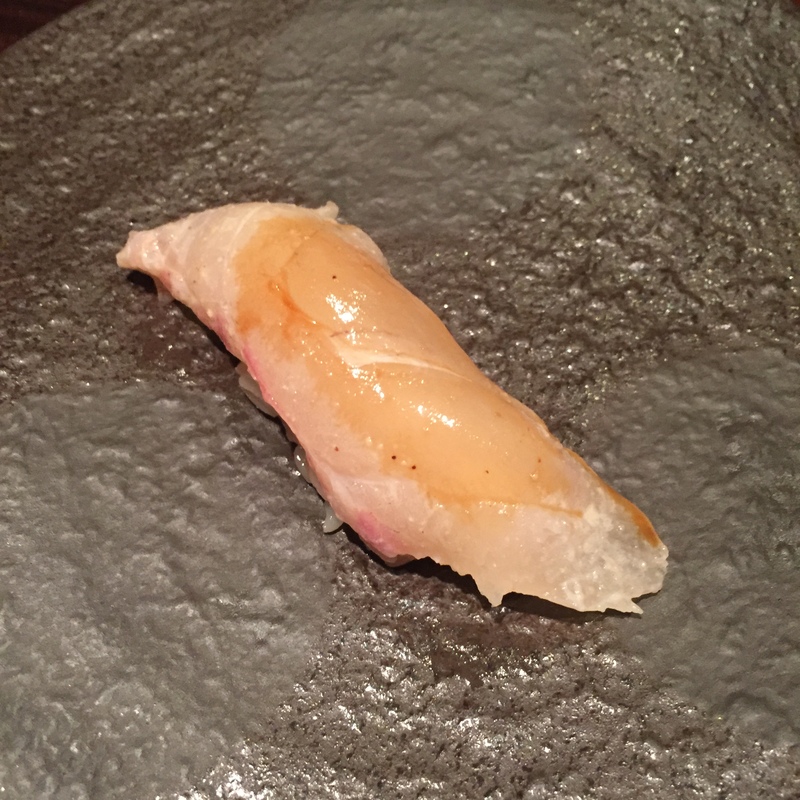 Nobu-san has never done this in the past, today, it was done with two of our servings, the MADAI and TAKO. Could not taste either fish, not one bit. Cost – It used to be 140 for 18 Pieces plus 1 hand roll OR any other additional piece, averaging to $7.37/piece. Now it’s 135 for 16 pieces plus 1 “bowl”, averaging to $7.94/piece. Again, difference is miniscule, but noticeable. 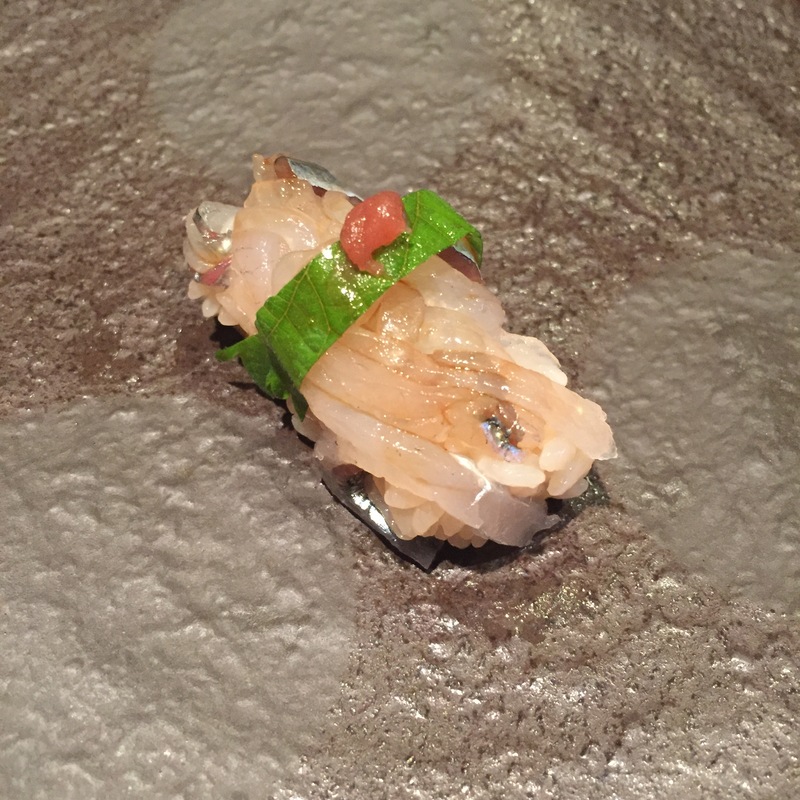 All that said, the meal was still one of the best omakases in town, and the service was as usual, impeccable. HATA (Grouper) – Served with ground radish. 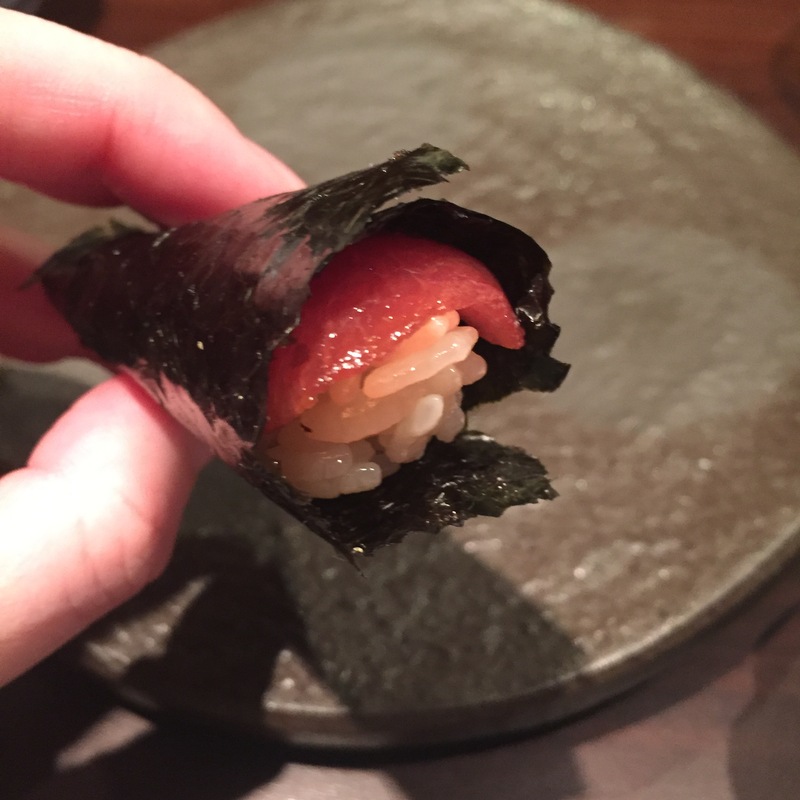 I don’t know of many other sushi-yas serving this very common fish, but I gotta say, if they do, they don’t do it nearly as well as Nobu-san. He makes this super simple fish, seem so much more complex, a divine blend of flavors! 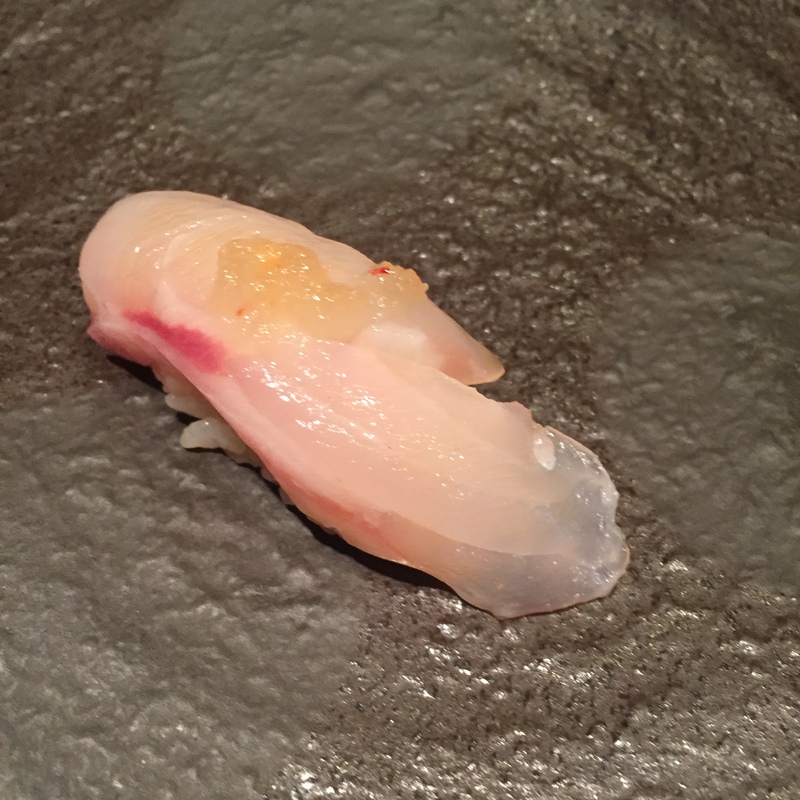 KASUGODAI (Baby seabream) – Chef started serving his KASUGODAI with egg yolk sometime last year. I don’t get it. I LOVE his KASUGODAI regardless, but the egg yolk adds absolutely nothing. MADAI (Seabream) – Marinated and topped with a sesame sauce. WTF is this??? Gives me flashbacks of chef Xiao from SUSHI DOJO. And not the good kind. 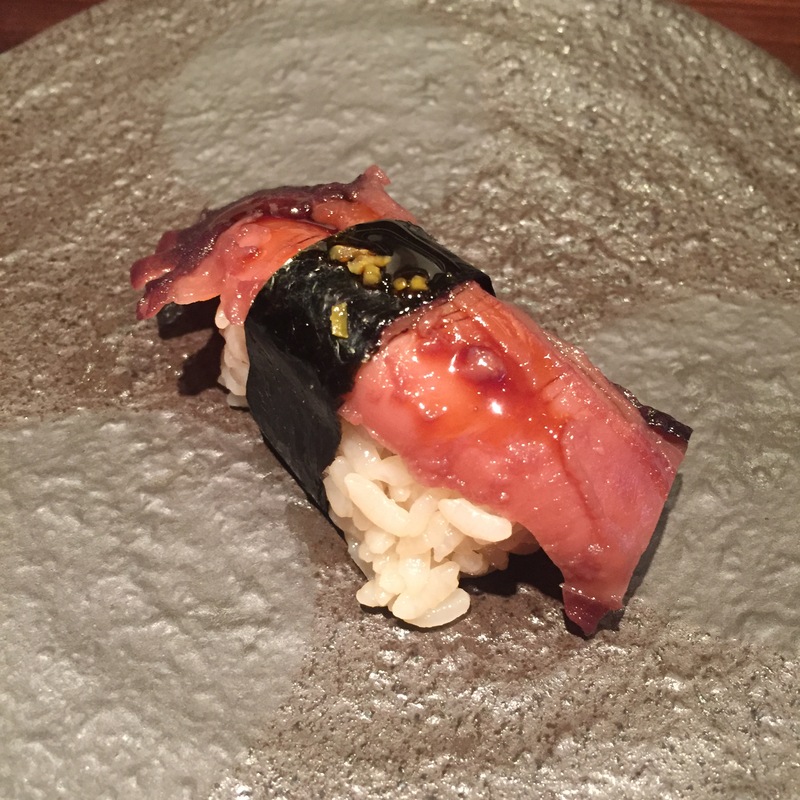 SHINKO (Baby Shad) – The plum topping, I could do without, but the thinly sliced strips, was a nice touch. Allowed the soy to seep in nicely. Very good. 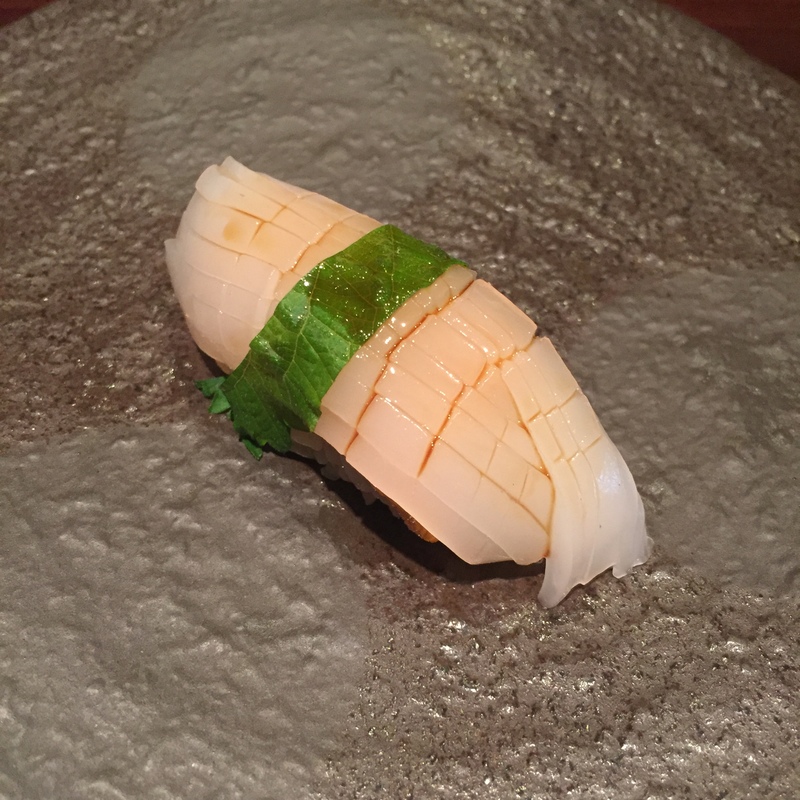 HOTATE (Scallop) – Nobu-san’s HOTATE is always so fresh, crisp, mild sea taste, great sea salt topping. Just great! 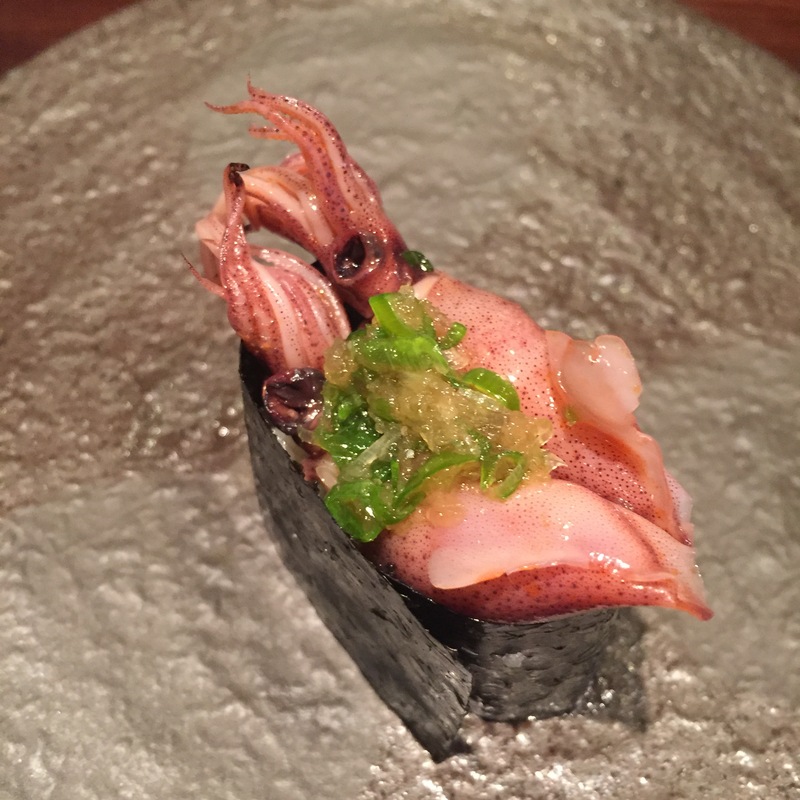 HOTARU IKA (Firefly squid) – The HOTARU-IKA was very nice, fresh, plump, super tasty. 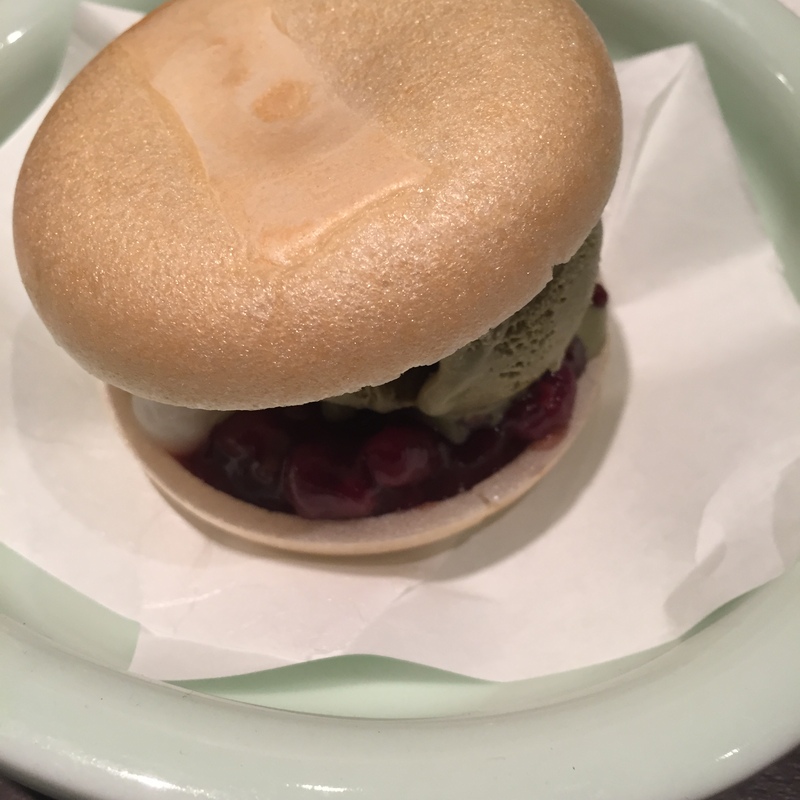 Again, not a huge fan of the topping, the radish-scallion mixture does not compare to the sweet miso dressing topper that Karma-san from BLUE RIBBON IZAKAYA, and Isoda-san from JEWEL BAKO does. That really is the perfect combo. Let’s not mess with a good thing. 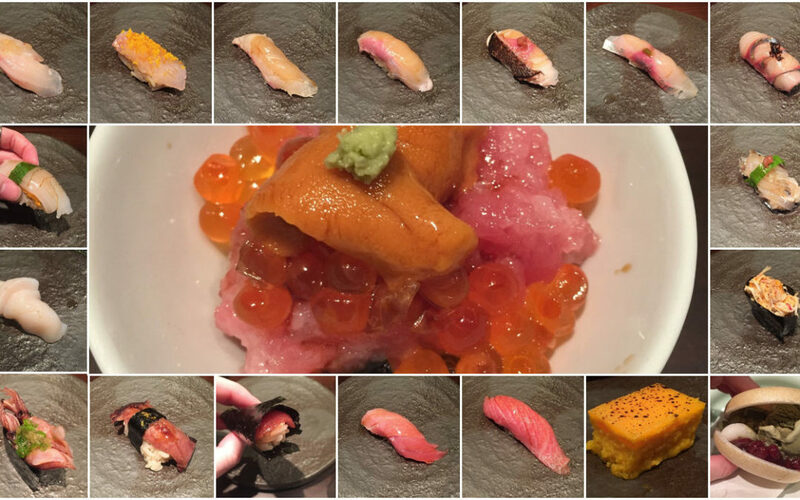 IKA, California UNI and SHISO – Always love Nobu-san’s IKA-UNI-SHISO combo. 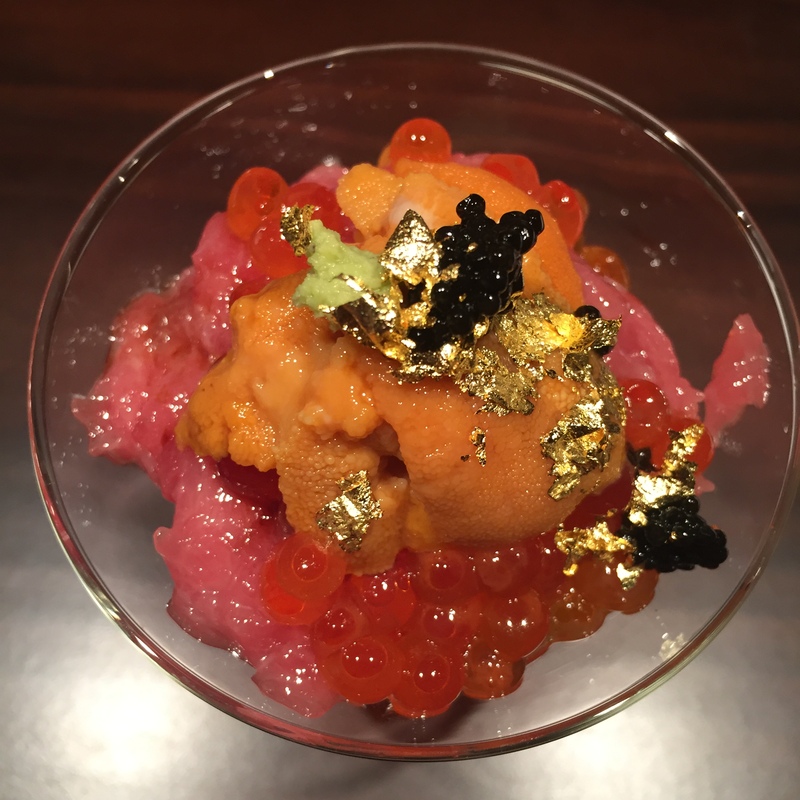 Chef combines beautiful California UNI with a perfectly scored IKA, allowing for all the flavors to meld and the soy to seep in. It’s one of my favorites! 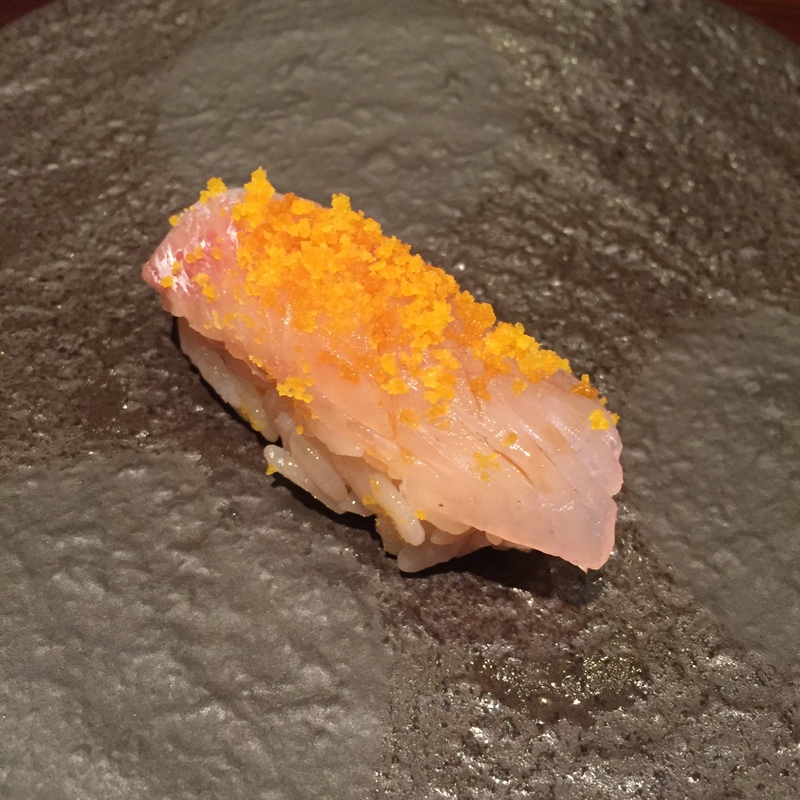 KANPACHI (Amberjack) – Topped with a small dolloop of yuzu pepper. Very good! 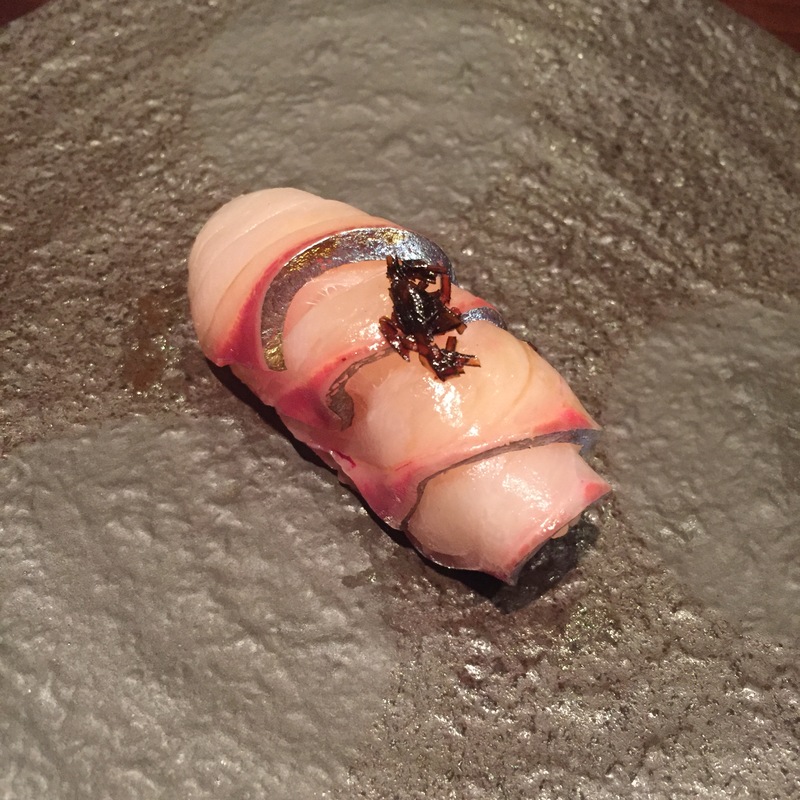 SHIMA AJI (Striped Jack) – Nobu-san always slices his SHIMA-AJI nice and thin, then layer it over the SHARI, and top it with dried kelp. Such a treat! 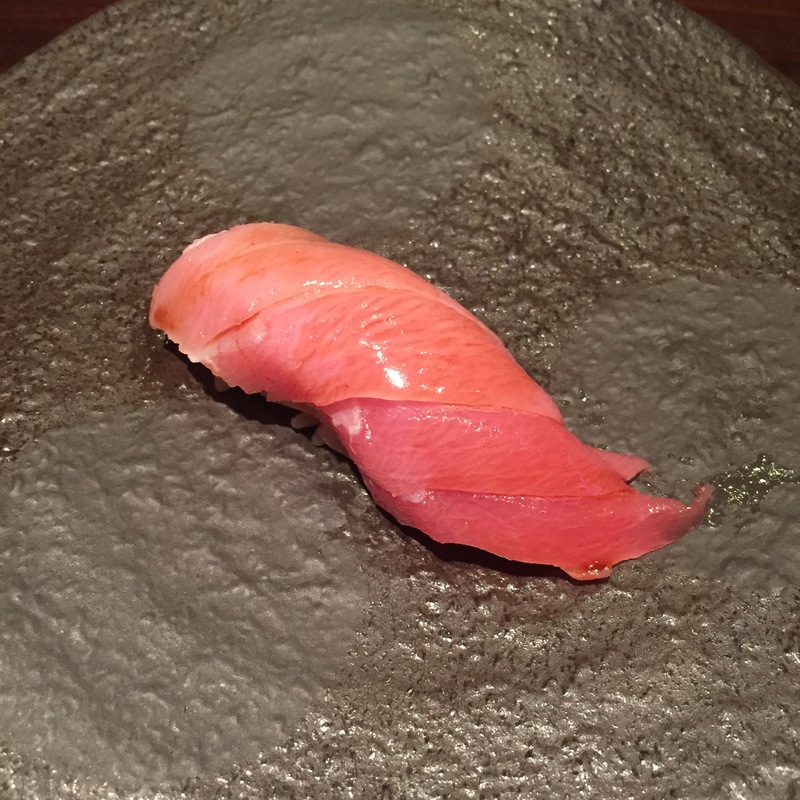 AKAMI (lean Bluefin tuna) – Wonderful! It was supposed to be lean, but it’s still got plenty of butter. Really delicious! 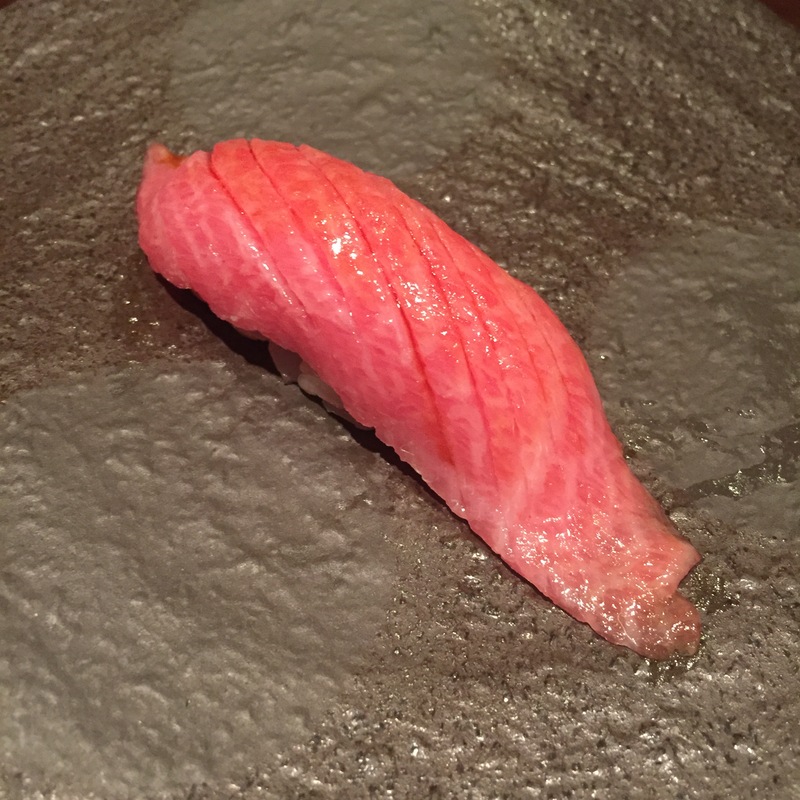 CHUTORO (Medium Fatty Tuna) – Another delicious cut! OTORO (Super Fatty Tuna) – Really good, but doesn’t compare to the other two servings of Tuna… There were some major veinage there! So chewy! 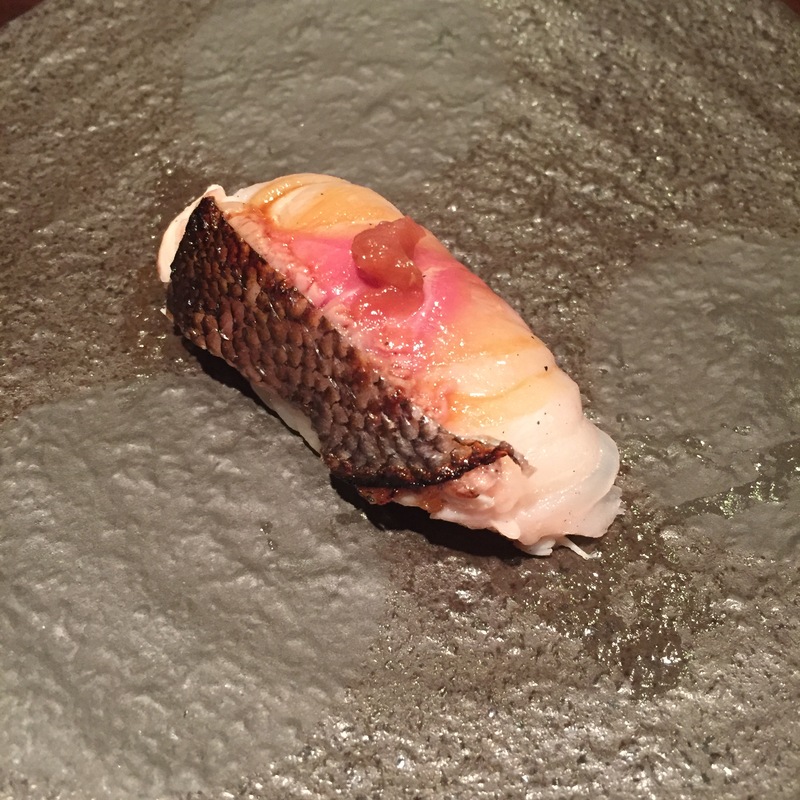 ISAKI (Grunt fish) – Skin was heavily ABURIed (torced), yeilding a lovely crunchy fattiness, and an all around incredible fish. The plum sauce, eh, not a fan. All around still spectacular! 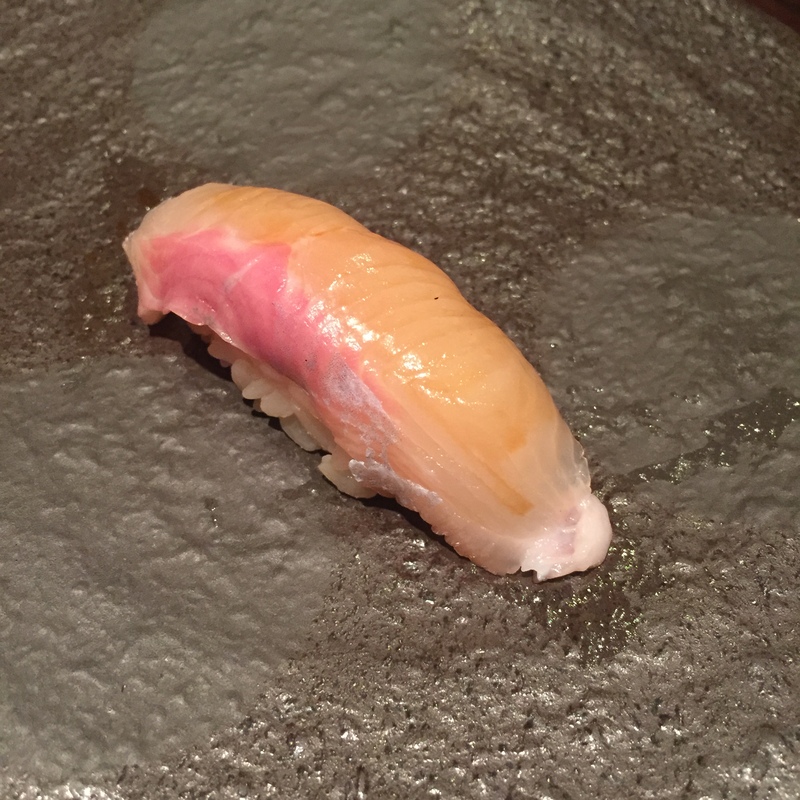 SHIRROKO (Baby Amberjack) – I am so annoyed with myself. 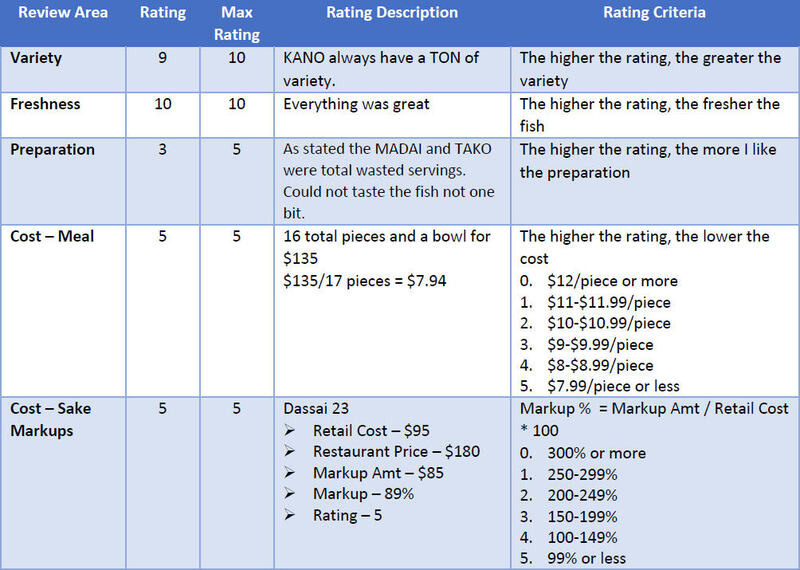 The last time chef served both the KANPACHI and the SHIRROKO, I told myself that I really need to have them side by side, like we did the MADAI and MEDAI. But why chef, why? Why do you insist upon spacing them out so much? 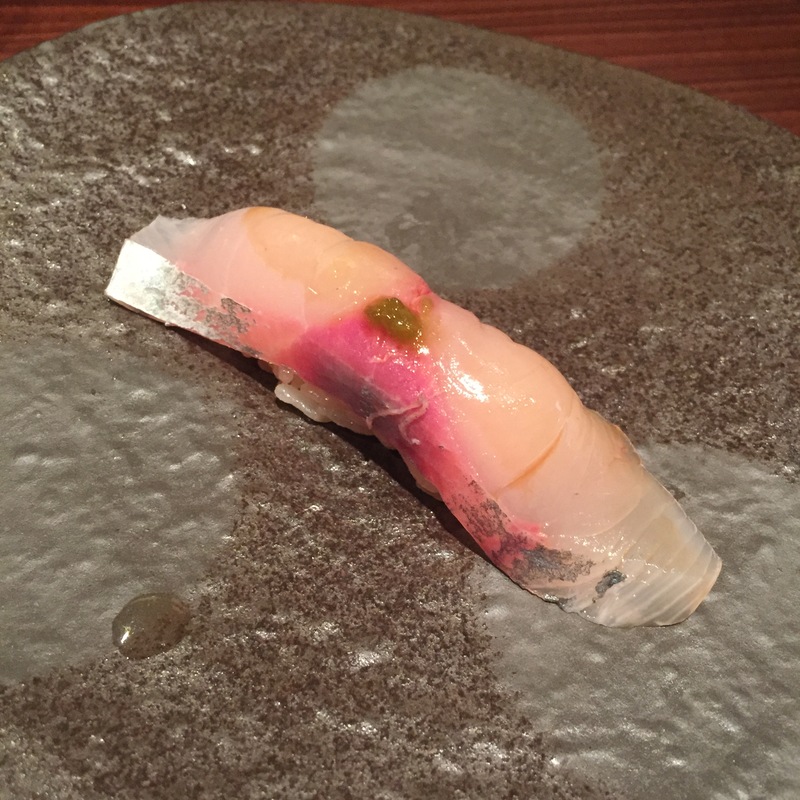 You serve the KANPACHI and the SHIMA AJI back to back! Fish was very good though. 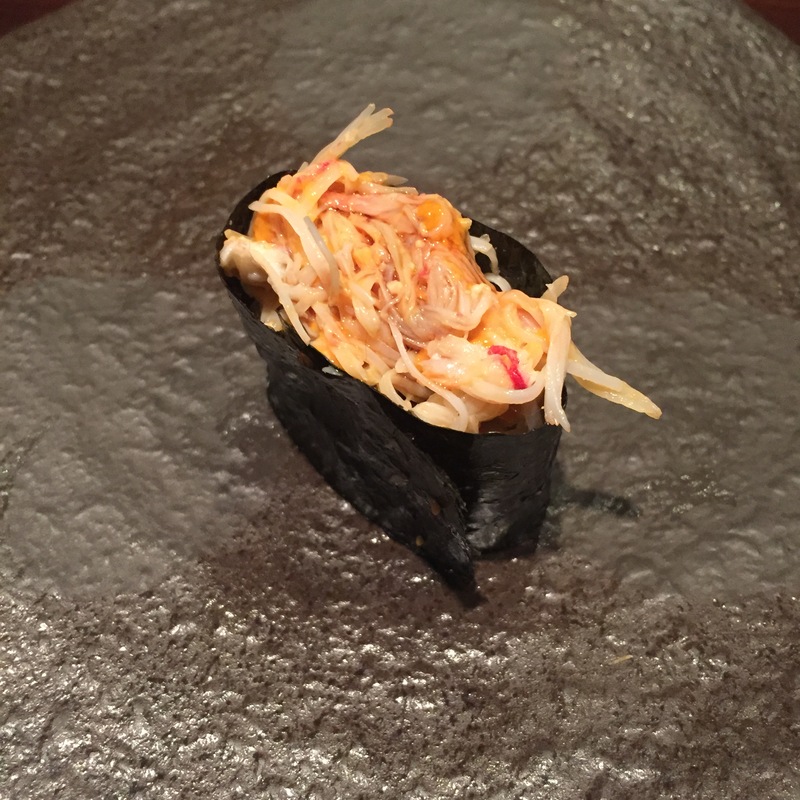 ZUWAI GANI (Snow crab) – ZUWAI GANI mixed with UNI and a bit of crab guts. It was very yummy, but not nearly enough crab if you ask me! 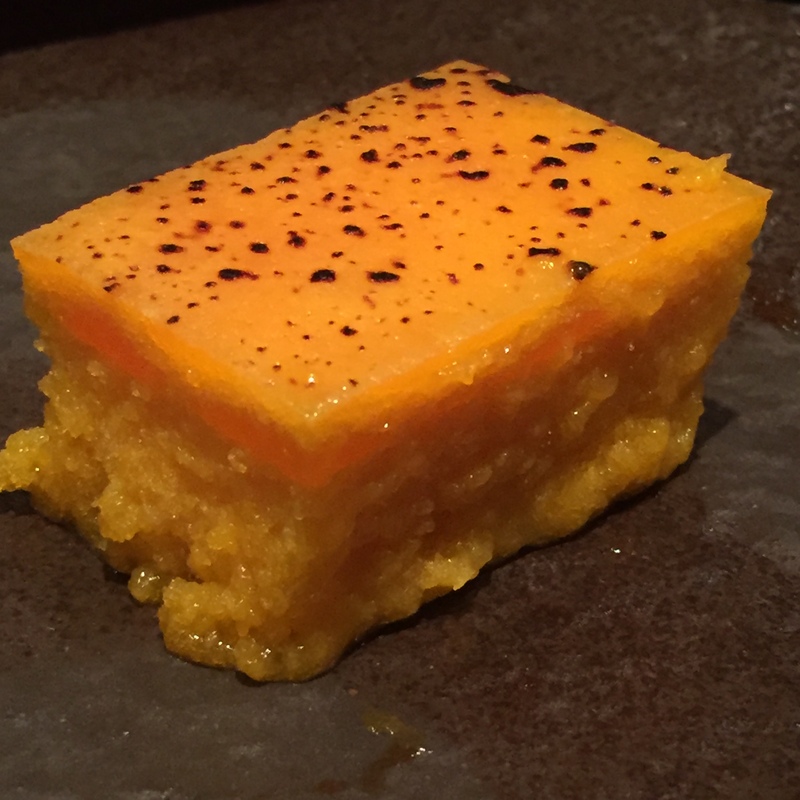 TAMAGO (egg custard) – I realized I never write about Nobu-san’s TAMAGO. BUT, it does deserve some recognition. It’s very custardy, very dessert like. Much better than most! 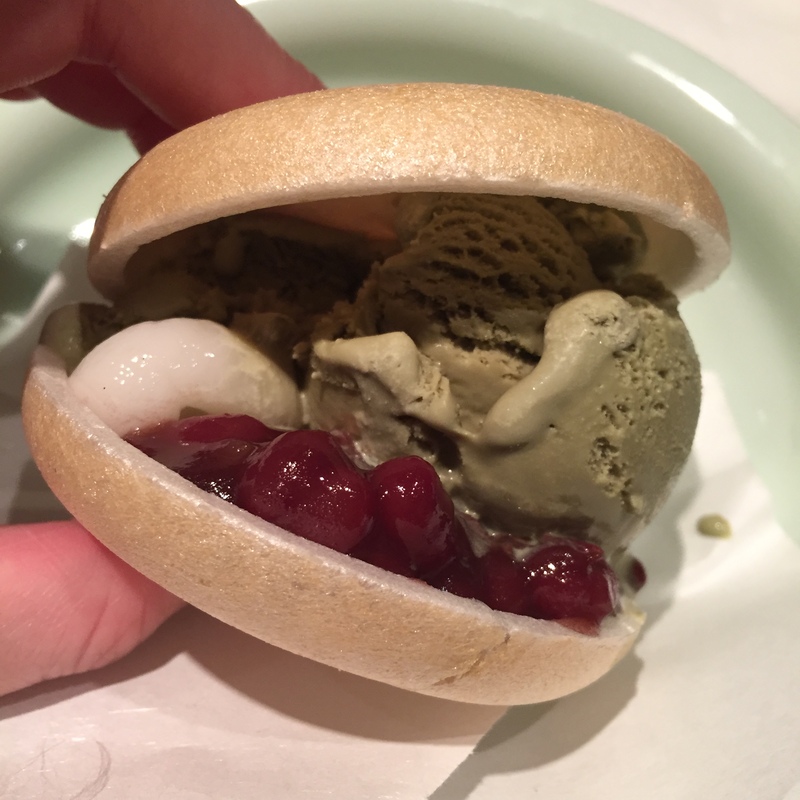 YUMMY Dessert – Same yummy red bean paste in an air-like puff of a pastry crisp, with green tea ice cream on top that Kanoyama have been serving for some time.